An Act to provide for the establishment and functions of the Serious Organised Crime Agency; to make provision about investigations, prosecutions, offenders and witnesses in criminal proceedings and the protection of persons involved in investigations or proceedings; to provide for the implementation of certain international obligations relating to criminal matters; to amend the Proceeds of Crime Act 2002; to make further provision for combatting crime and disorder, including new provision about powers of arrest and search warrants and about parental compensation orders; to make further provision about the police and policing and persons supporting the police; to make provision for protecting certain organisations from interference with their activities; to make provision about criminal records; to provide for the Private Security Industry Act 2001 to extend to Scotland; and for connected purposes. The Serious Organized Crime and Police Act 2005 (c.15) (often abbreviated to SOCPA) is an Act of the Parliament of the United Kingdom aimed primarily at creating the Serious Organised Crime Agency. It also significantly extended and simplified the powers of arrest of a constable and introduced restrictions on protests in the vicinity of the Palace of Westminster. It was introduced into the House of Commons on 24 November 2004 and was passed by Parliament and given Royal Assent on 7 April 2005. Measures to introduce a specific offence of "incitement to religious hatred" were included in early drafts of the Act, but then dropped so the bill would pass before the 2005 general election. The offence has since been created by the Racial and Religious Hatred Act 2006. The Act applies principally to England and Wales but s.179 permits the extent or designates sections applying only to Scotland and/or Northern Ireland; additionally s.179(9) extends the application of four sections (ss.172, 173, 177, 178) beyond the United Kingdom to the Channel Islands and the Isle of Man. The Act introduced changes to the powers of arrest utilised by both "constables" and "other persons" in England and Wales. The term arrestable offence ceased to have effect as, bar a few preserved exemptions, one power of arrest now applies to all offences when the arrest is made by a constable. Where the threshold of an arrestable offence was previously used to enable specific powers of search or powers to delay certain entitlements, these powers are preserved, but the threshold is changed to that of an indictable offence. Given the scope of the last two provisions, a new Code of Practice was issued for guidance. These changes were enacted on 1 January 2006. The Act is controversial primarily for sections 132 to 138, which restrict the right to demonstrate within a "designated area" of up to one kilometre from any point in Parliament Square. Demonstrators must give written notice to the Commissioner of the Metropolitan Police six days in advance, or if this is not reasonably practicable then no less than 24 hours in advance. The area itself is defined by a Statutory Instrument, the Serious Organised Crime and Police Act 2005 (Designated Area) Order 2005, rather than the Act. It specifically excludes Trafalgar Square, a traditional site of protest on the northern boundary of the area. Apart from Parliament it also includes Whitehall, Downing Street, Westminster Abbey, the Middlesex Guildhall, New Scotland Yard, and the Home Office. It also covers a small section of land on the other bank of the River Thames, including County Hall, the Jubilee Gardens, St Thomas' Hospital and the London Eye. These provisions of the Act were introduced partially as a result of Brian Haw and his Parliament Square Peace Campaign. Haw was a peace campaigner, who from 1 June 2001 until his death on 18 June 2011 protested against Britain and the United States' policy towards Iraq. He used placards and a loudspeaker to get his message across, which some British MPs found disruptive. Patrick Cormack MP said in a Parliamentary debate on 7 February 2005 that the lives of "members of staff in Portcullis House and 1 Parliament Street, as well as the police who are on duty at Members entrance day after day ... are made intolerable by those people baying away, without a crowd to address, merely repeating themselves ad nauseam." However, others, such as Jeremy Corbyn MP disagreed, saying "The Minister should think carefully about removing rights that are enshrined in our history", and Glenda Jackson MP agreed with him, saying "I regard it as the voice of democracy". Lembit Öpik MP drew attention to the comments of the Prime Minister Tony Blair, who, on 7 April 2002, said: "When I pass protestors every day at Downing Street ... I may not like what they call me, but I thank God they can. That's called freedom." The Home Office stated the security concerns, such as the possibility of explosive devices being left in and around Haw's paraphernalia, were another reason for the legislation. The legislation initially appeared ineffective against Mr Haw. The High Court of Justice ruled that as Haw's protest had begun in June 2001 he was not required to get authorisation. The three-strong judicial panel accepted arguments by Mr Haw's lawyers that the law only applied to demonstrations that took place after it came into force, not those previously in progress. However, on 8 May 2006, this decision was overturned by the Court of Appeal. On 1 August 2005, the day that the Act came into force, the Stop the War Coalition and others organised a protest against the prohibition. They did not officially ask for permission, but at the subsequent court cases it was revealed that the Stop the War Coalition had negotiated with police about the protest. The action attracted some 200 people according to reports – among them Lauren Booth, Tony Blair's sister-in-law – and five people were arrested. The first conviction under the Act was in December 2005, when Maya Evans was convicted for reading the names of British soldiers killed in the Iraq War, near the Cenotaph in October, without police authorisation. In 2006, the comedian and political activist Mark Thomas attacked this section of the act by organising several protests within the area, within the confines of the law. His most notable was when he organised 21 protests over the course of a single day within the area. This act got Thomas into the Guinness Book of Records for taking part in the most protests in a single day. However, as the first and last protest took place in the same location, only 20 protests are recognised by Guinness. In January 2007 Tate Britain opened State Britain, an installation by artist Mark Wallinger that recreated the display confiscated by the police from Brian Haw's protest. 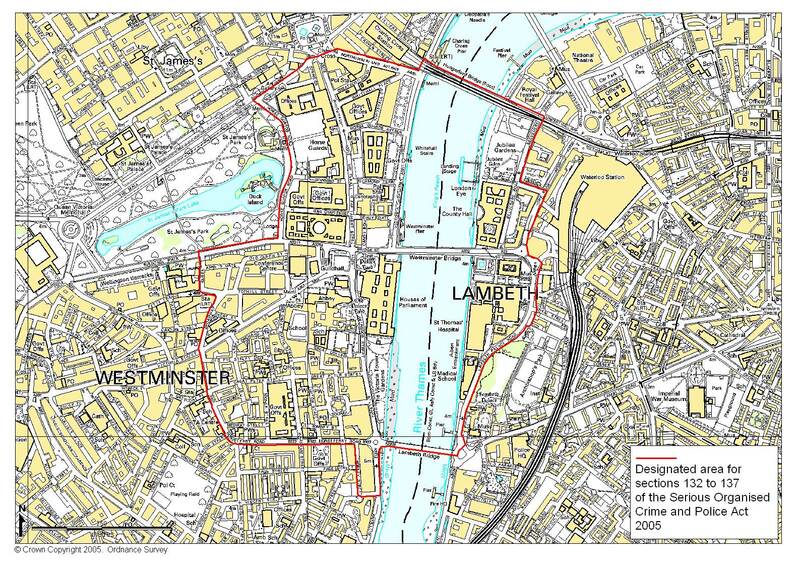 The Tate press release on the exhibition mentioned that the Serious Organised Crime and Police Act 2005 prohibited "unauthorised demonstrations within a one kilometre radius of Parliament Square" and that this radius passed through the Duveen Hall, literally bisecting Wallinger's exhibit. Wallinger marked this on the floor with a black line running through the Tate. Press reports dwelt on the potential dangers of this infringement, speculating that the police might even remove the half of the exhibit on the "wrong" side of the line. Charles Thomson of the Stuckists art group wrote to The Guardian, pointing out that the exclusion zone ended at Thorney Street, 300 yards before the Tate. Gordon Brown said that he planned to look again at this section of the SOCPA, meaning that protesters would eventually be able to protest freely in the kilometre-radius of parliament without prior authorisation being needed. In October 2007, the Home Office published a public consultation document, Managing Protest Around Parliament, which "takes another look at sections 132–138 [of SOCPA] and explores whether there is another way to address the situation that would both uphold the right to protest while also giving police the powers they need to keep the peace". Campaigners are worried that this document contains new threats to freedom of assembly and the right to protest in that is suggests that there could be "harmonisation of powers to manage marches and assemblies" throughout the UK. Sections 132 to 138 of the Act were repealed by the Police Reform and Social Responsibility Act 2011, which provides for a different scheme of "prohibited activities" on Parliament Square. SOCPA also amended the Protection from Harassment Act 1997 so that "pursuing a course of conduct" amounting to harassment could mean approaching two people just once, rather than one person at least twice, as before. Commentators such as George Monbiot have voiced the concern that the amended Harassment Act effectively "allows the police to ban any campaign they please". ^ The citation of this Act by this short title is authorised by section 179(1) of this Act. ^ "House of Commons Hansard, Vol. 428 Col. 102". Hansard. London: United Kingdom Parliament. 24 November 2004. Retrieved 20 June 2010. ^ OPSI (2005). "Police powers etc". Serious Organised Crime and Police Act 2005. Retrieved 18 April 2009. ^ a b "Judges rule against peace vigil". BBC News. 8 May 2006. Retrieved 23 May 2010. ^ a b "Brown 'to change' protests laws". BBC News. 3 July 2007. Retrieved 20 June 2010. ^ "Haw, R (on the application of) v Secretary of State for the Home Department & Anor  EWCA Civ 532 (08 May 2006)". Bailii.org. Retrieved 12 August 2014. ^ a b Tempest, Matthew (1 August 2005). "Five arrested during Westminster free speech protest". The Guardian. Retrieved 20 June 2010. ^ "Activist convicted under demo law". BBC News. 7 December 2005. Retrieved 23 May 2010. ^ Naomi Gallichan (22 November 2006). "Review: Mark Thomas, The Royal Court, Liverpool". liverpool.com. Archived from the original on 3 December 2007. Retrieved 24 June 2009. ^ Mark Thomas (12 October 2006). "Mark Thomas on demonstrating near the Houses of Parliament". London: The Guardian. Retrieved 24 June 2009. The Serious Organised Crime and Police Act 2005, as amended from the National Archives. The Serious Organised Crime and Police Act 2005, as originally enacted from the National Archives. Explanatory notes to the Serious Organised Crime and Police Act 2005. Henry Porter, The Guardian, 6 November 2005, "A law the Stasi would have loved"
This page was last edited on 20 August 2018, at 00:03 (UTC).